This post was also published on ScrumAlliance.org. Way to go, Justin! I’m sure the concept is not new, but it was introduced to me by a highly talented Agile mentor a number of years ago. With a view to helping other Scrum practitioners, here I’ll outline my structure and experience with a recent reset I held with my current team. My primary reason for conducting this was that the team had successfully implemented the practices for Scrum but didn’t really understand the values or principles behind it. The team therefore suffered from the common situation of “doing” Agile, not truly “being” Agile — i.e., it was compliant, not committed. You may ask, “Why would a mature team need to revisit the fundamentals of Scrum?” To which I would reply: purely to see either where their journey began or where they may have gotten lost. 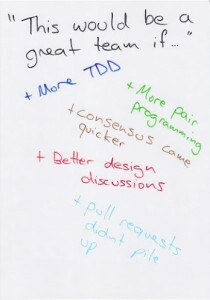 Although my team was a year into using Scrum, it was interesting to cover the four meetings (planning, daily stand-up, sprint review, and retrospective) and three artifacts (product and sprint backlogs and the burn-down chart) and discuss the usage and value of each. A good example of how to deliver this (which I used as a reference) is done by my friend and mentor/coach Lyssa Adkins at http://www.youtube.com/watch?v=_BWbaZs1M_8. Until recently, I didn’t really appreciate the importance and complexity that values had in Scrum. For a team to truly realize the Scrum/Agile dream, each member and the team as a whole needs to embrace and live the values outlined in the Scrum framework. A common problem with implementing Scrum is that the practices and processes are put in place, but the underlying values that make it work are either not articulated or are forgotten altogether. To deliver this part of the reset, I simply went through the values one at a time — focus, commitment, respect, courage, and openness — and then let the team discuss them. The critical part of this is that each member needs to find a meaning for the values that has relevance for him or her. Now, this was an exercise that I had never tried before and, to be honest, I was concerned that the team would find it a little woolly or fluffy. In fact, I was surprised at the level of acceptance and relevance the team got from it. The concept of the high performance tree is to create a visual metaphor around the foundation values (or roots) of Scrum. Then you extend these roots into attributes and characteristics that describe a high-performing team and, finally, articulate the outcomes that can be achieved. If you follow this step in the order in which I lay out the reset at the beginning of this article, then this part is simple. Simply review the core values of Scrum and set the foundation of this metaphor by depicting the roots of the tree, which are the values of focus, commitment, respect, courage, and openness. This can be a powerful coaching tool on a daily basis. Asking questions such as, “Where are our roots weak?” can give the team insight into existing issues that they may not have seen before. With strong roots, a team can start to extend itself to the higher-reaching aspects of a high-performing team. Next, discuss what is beyond the roots and trunk of the tree — the leaves — and what a team needs to look like if it wants to take its next steps on its journey to high performance. Empowerment, self-organization, and trust are just a few of the aspects that the team needs to master. Depending on the maturity of the team, you can either use a predefined list (as I did) or make it more of a discussion. As with the root Scrum values, the team needs to buy into this concept. If the concepts discussed aren’t valuable to the team, then the discussion will not convey as powerful a message as it should. Let’s be frank: The main reason we all work so hard with our teams and Scrum is to help them (and the greater organization) realize the truly amazing things that can happen when a team reaches high performance. The “fruit” of reaching this goal is to see a team produce faster results and get to the right solution more quickly. It fosters an attitude that allows teams and members to grow as professionals and in their Scrum journey, finally reaching a point with where they produce astonishing results and are a team that can do anything. Listing these goals as part of the team reset helps team members visualize where they want to be, and how they can get there. This exercise is the easiest and most interactive of the reset. I simply wrote an unfinished sentence on the whiteboard: “This would be a great team if. . . . ” The team members then got up out of their seats and started writing, discussing, and adding to the list. This was a productive section of the reset, and in the future I will allow a bit more time for it. The final list should be written up so that it can be displayed in the team area for all to see. Examples that can come out of a session like this include “reaching consensus more quickly,” “holding better design discussions,” or whatever your team feels it needs to improve. Sometimes it’s a good idea to revisit the fundamentals of Scrum, most importantly its underlying values. My team is on its second sprint after our reset and is already showing a renewed focus, commitment, and passion for delivering high-quality software and for continuing the journey on the Scrum path toward high performance. This post was originally created at Justin’s blog and later published at ScrumAlliance.org.